The static getColor() function shows the dialog and allows the user to specify a color. The getRgba() function does the same but also allows the user to specify a color with an alpha channel (transparency) value. See also Dialog Classes and Graphics Classes. Returns custom color number i as a QRgb. Pops up a modal color dialog, lets the user choose a color, and returns that color. The color is initially set to initial. The dialog is a child of parent and is called name. It returns an invalid (see QColor::isValid()) color if the user cancels the dialog. All colors allocated by the dialog will be deallocated before this function returns. Pops up a modal color dialog to allow the user to choose a color and an alpha channel (transparency) value. The color+alpha is initially set to initial. The dialog is a child of parent and called name. If ok is non-null, *ok is set to TRUE if the user clicked OK, and to FALSE if the user clicked Cancel. 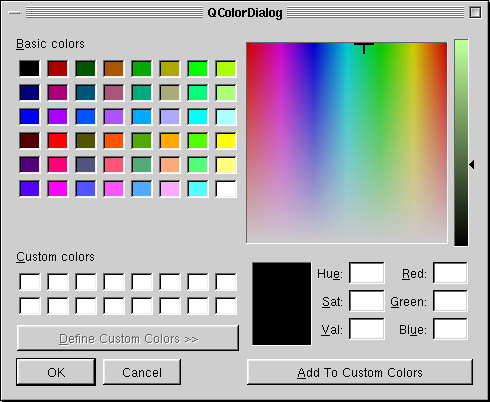 Sets custom color number i to the QRgb value c.
Sets standard color number i to the QRgb value c.